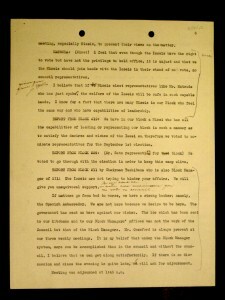 After the attack on the American naval base at Pearl Harbor on December 7, 1941, fear of the Japanese in the United States spiked, culminating in Executive Order 9066. This evacuation order resulted in the relocation of over 110,000 Japanese Americans into ten different internment camps around the Western United States. Once in the camps, internees faced circumstances radically different from the patriarchal society that they were used to. Community leadership positions were given almost exclusively to Nisei, or second-generation Japanese immigrants, over their non-citizen parents. 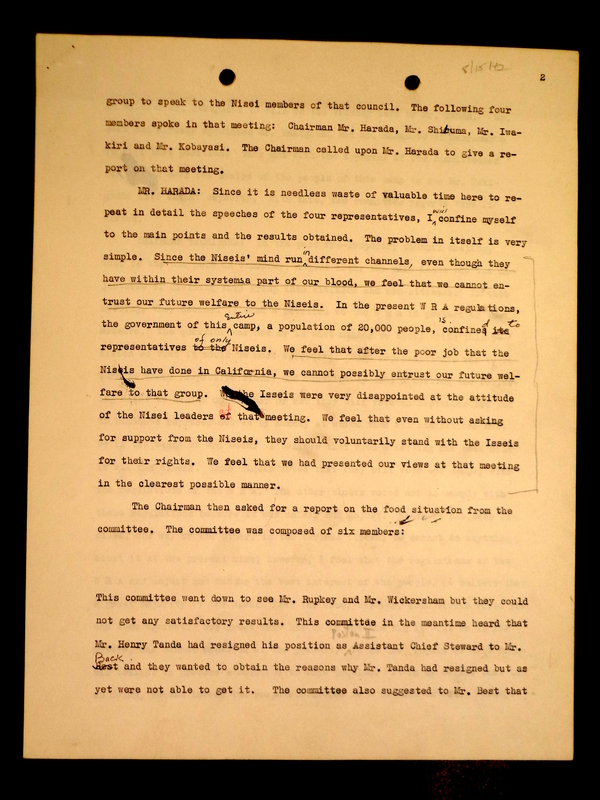 As seen in a 1942 meeting transcript of an Issei Informal Representative Council within the Poston, Arizona internment camp, first-generation immigrants were extremely unhappy with internment policies, as they were treated as second-class Americans relative to their children. Despite understanding that the injustice within the camp was the fault of the War Relocation Administration, first-generation immigrants either supported their descendants as a means of exerting their own power, or they did not endorse the Nisei government at all. The Issei, or first-generation immigrants, understood that the prominent generational inequality of the internment camps was entirely the fault of the War Relocation Authority’s inadequacy. Many of the policies made to govern the internment camps had been created hastily and did not reflect an ideal camp organization. 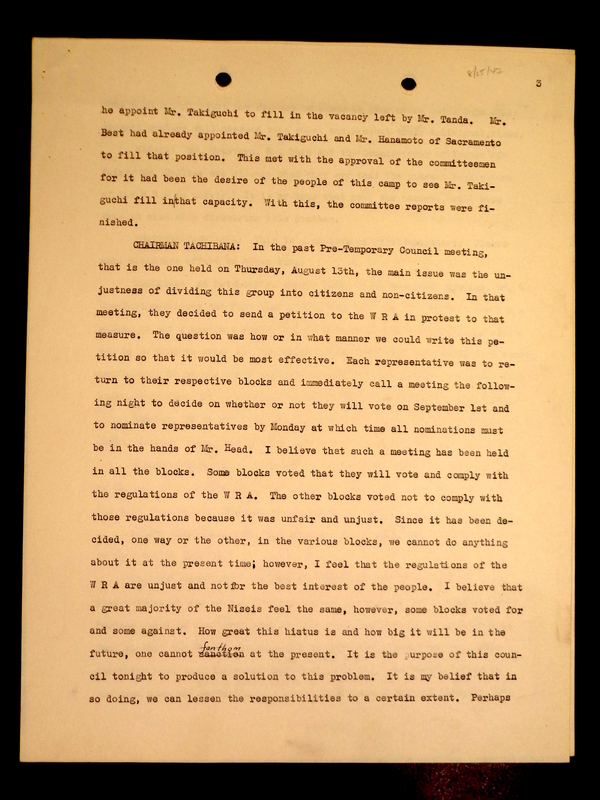 In the Issei Council meeting it was stated that even army officials acknowledged the ill-advised nature of camp policies. 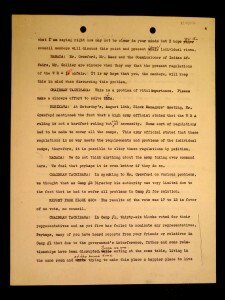 A council member reported, “A high army official stated that the WRA ruling is not a hardfast ruling but one of necessity… this army official stated that these regulations in no way meets the requirements and problems of the individual camps…”  The central problem with the poorly constructed policies was that it introduced an estrangement between the two generations of Japanese Americans. In discussing the Pre-Temporary Council, the chairman of the Issei Informal Representative Council, Chairman Tachibana, stated, “…the main issue was the unjustness of dividing this group into citizens and non-citizens.”  The WRA essentially created a political stratum, in which the Issei were considered lesser than their children and descendants. This caused a significant degree of discontent among the Issei, since the power that many of them had experienced outside of the camps was suddenly revoked and bestowed upon their young American counterparts. In doing so, the U.S. government and the WRA created a system that fostered a sense of unease and insecurity among its older generation. Issei members of society were unhappy with the lack of thought and planning put into the camps by the War Relocation Authority, and reacted to their children’s government in a couple of ways. In one approach to the power shift, some Issei took a realistic stance by accepting their loss of community positions and tried instead to influence their younger counterparts. In his opening remarks, the Issei council chairman stated, “The Issei are not speaking against the Niseis, nor are we saying that we will not support them. The inequality which exists at the present is blamed either on the WRA, the army or the government or the Caucasian group of the camp.”  Many Issei were willing to support the Nisei, but that did not mean that they wanted to completely relinquish their power. 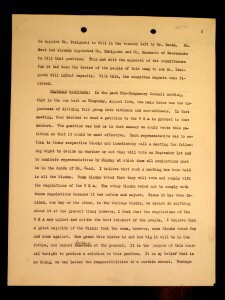 One member of the council declared, “In order not to cause trouble, we will elect Nisei representatives, however, we want them to understand that they will be working for all the people as a Japanese and not as an American.”  Although seemingly simple, this desire for Nisei to act as Japanese and not Americans was no small request. The second-generation immigrants were just as American as they were Japanese, since they had been raised in an environment full of pride for the United States and its causes. The Issei were trying to salvage what control they once had, and one of the only ways they could do that was to pressure those still in power. As they were not and could not become citizens, Issei were in the very difficult position of trying to maintain their influence while watching their children and other descendants lead. Although some Issei accepted their loss of direct community leadership, many still did not feel that Nisei could effectively act as their representatives due to their clear generational differences. As one Issei stated, “Since the Niseis’ mind run in different channels, even though they have within their systems a part of our blood, we feel that we cannot entrust our future welfare to the Niseis.” Even though both groups were stuck in the same restrictive situation, the Issei had trouble trusting the Nisei to properly serve their interests and believed that they should be removed from power. The Nisei were born and raised in the US, so they tended to have very different stances on the war and Japan than their predecessors. In some cases, the strain of generational differences was too much even for some families to withstand. 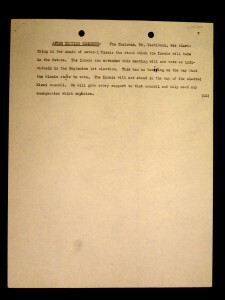 In discussing the results of other camps nearby, Chairman Tachinaba reported, “In Camp #1 that due to the government’s interference, father and sons [sic] relationships have been disrupted.”  Many Issei were also disgruntled by examples of poor Nisei leadership, especially in more established interment camps. In her book, Schools Behind Barbed Wire, Karen Lea Riley states that as a result of Nisei leadership, “…community stability began to erode, and was replaced by high tension and the emergence of youth gangs.” One member of the Issei Council in Poston verbalized Issei doubts, saying, “We feel that after the poor job that the Niseis have done in California, we cannot possibly entrust our future welfare to that group.”  He continued on to say, “Isseis were very disappointed at the attitude of the Nisei leaders at that [joint Issei and Nisei] meeting. 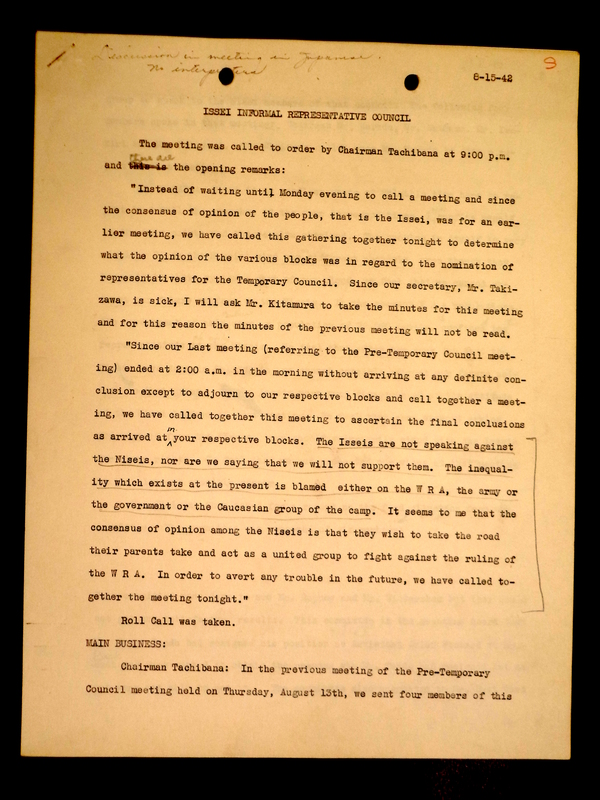 We feel that even without asking for support from the Niseis, they should voluntarily stand with the Isseis for their rights.” 9 Issei were especially concerned with the Nisei leaders who had acted as informants to the U.S. government. 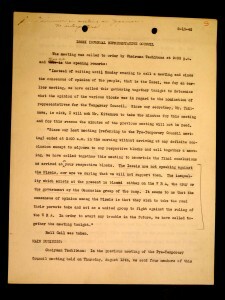 In his book, Japanese American Celebration and Conflict, Lon Kurashige states, “…beginning in early 1941, JACL’s ‘anti-Axis’ provided valuable ‘anti-subversive information’ enabling American intelligence agencies to pinpoint hundreds of Issei whom they believed might be dangerous in the event of a U.S.-Japan war.” 10 Some Nisei felt their loyalties to the U.S. so strongly that they were willing to give up their older counterparts to prove their patriotism. Second-generation Japanese immigrants were raised in American culture and felt a different allegiance than their ancestors, creating a divide between themselves and the Issei that could not be reconciled. Due to the rushed creation of the internment camps, many problems and objections arose under the War Relocation Authority’s policies. Only second-generation Japanese immigrants could hold community offices, leaving first-generation immigrants feeling dissatisfied and improperly represented. 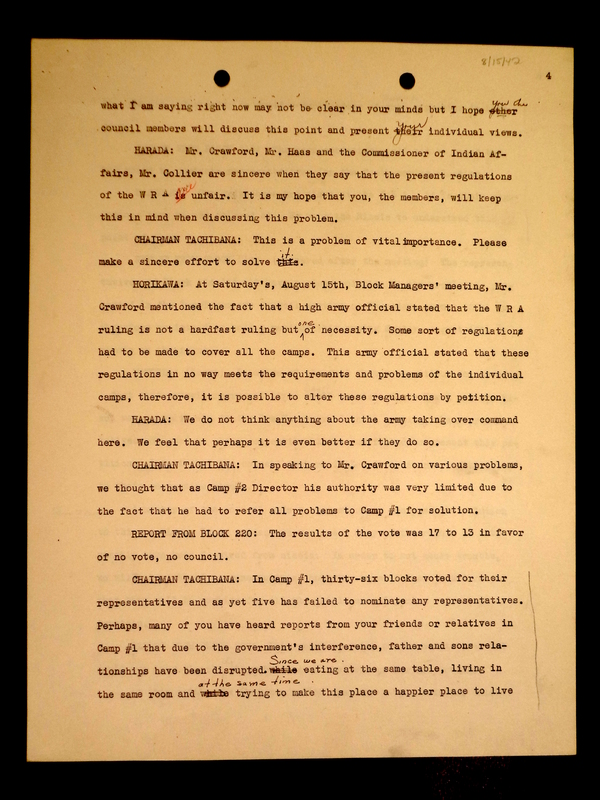 Although the Issei did not blame the Nisei for their lack of say, opinion about the Nisei in power was mixed. Generational differences caused some Issei to try to influence their descendants while others simply wanted them removed from power. The war and the United States’ treatment of Japanese Americans put the Japanese at odds with each other, as a hierarchical system based on generation was created. 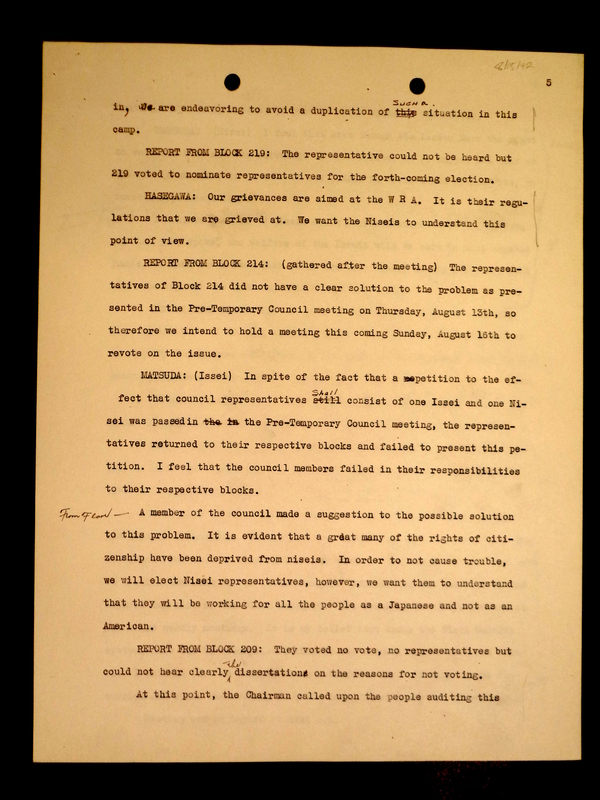 “Issei Informal Representative Council (8-15-42).” Japanese-American Relocation Centers Records, Box 6, File 20. 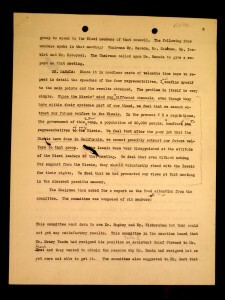 Division of Rare and Manuscript Collections, Cornell University Library. 4. “Issei Informal Representative Council (8-15-42).” 3. “Issei Informal Representative Council (8-15-42).” 1. 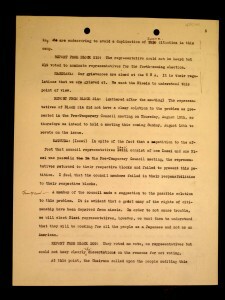 “Issei Informal Representative Council (8-15-42).” 5. “Issei Informal Representative Council (8-15-42).” 2. 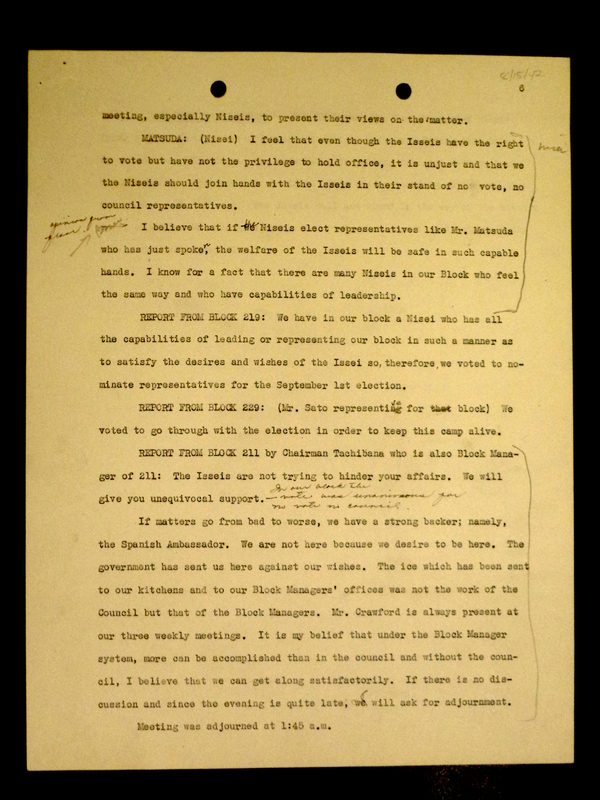 “Issei Informal Representative Council (8-15-42).” 4. Riley, Karen Lea. “The Japanese Struggle for Control.” In Schools Behind Barbed Wire: The Untold Stories of Wartime Internment and the Children of Arrested Enemy Aliens (Rowman & Littlefield, 2002), 92. Kurashige, Lon. “War and the American Front.” In Japanese American Celebration and Conflict: A History of Ethnic Identity and Festival, 1934-1990, 79. University of California Press, 2002.